Enjoying the morning sun with our coffee! There are many attributes that make a coffee cafe a fine one, but Java Earth Café has a unique reason to make me and my cup of coffee happy. 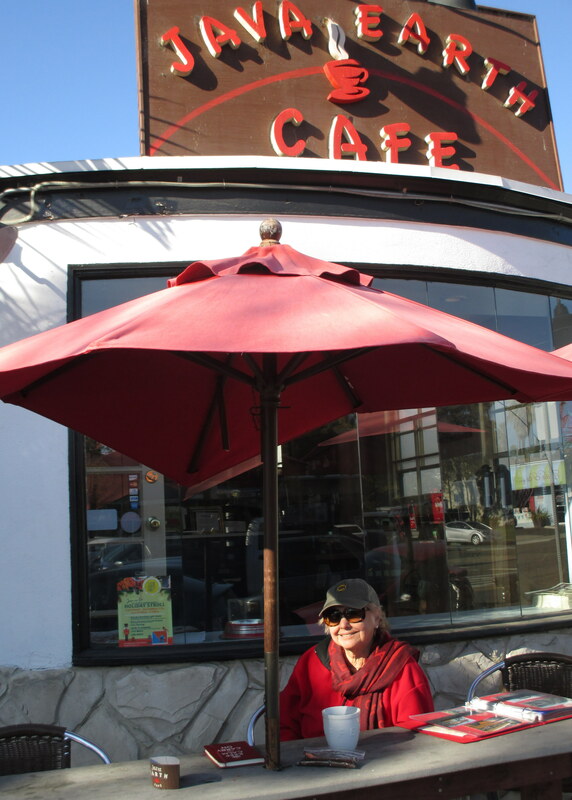 They serve excellent coffee, roasted by Calabria, but I love that their outside tables face east so you can enjoy your cup of coffee and feel the warmth of the morning sun. There are umbrellas to provide shade if that’s your preference, but the warmth of the sun is welcome. This January they accepted Starbucks gift cards and gave equal credit (up to $50) to us for an account with them. We were in! Tip: I always like to ask for my coffee in a “real” cup rather than a paper cup. You’re out to enjoy a wonderful cup of coffee, why drink from paper cups? Plus it’s good for the environment. Java Earth Café reminds me of my favorite spot to get coffee in Borrego Springs: Olde Homestead Fudge Company, but we’ll have more on that favorite spot in another posting. This entry was posted in Coffee shops in San Diego and tagged Borrego Springs, Pacific Beach. Bookmark the permalink.